Ben had tried learning to ride a bicycle two times before, when he was younger. That bike, now far too small for his growing frame, is a distant memory. He had expressed a willingness to give it another go and we agreed as a family to look at finding a used bike on Kijiji or at a garage sale before leaping in and buying something brand new. As it turned out, Heather ran across a killer bike selection at a garage sale over the weekend and came home with a good-as-new unit in the car, back seat folded down to give it enough room to fit. Over the next couple of days, Ben grabbed his helmet and the bike, and tried over and over again to negotiate the balancing act that those of us who have mastered it take for granted. His mind was so focused on finding the pedals after pushing off, looking down, that he would get through a few revolutions and end up tumbling over. Insisting on learning on the sidewalk, where you only have four feet of concrete width to play with, I insisted he take the show on the road, where there was endless bicycling real estate. "Papa is more strict than you," he said to Heather later in the afternoon, after I had left to go fishing. I was trying not to be, but I was becoming increasingly frustrated not knowing what to do to help him over this particular mountain. Ten feet became twenty which grew into thirty - he was making progress, but eventually would fall and pick himself up again. He took a break and I took off fishing. About an hour later, he scaled the summit and was embarking on a bike trip to the ice cream store with Heather to celebrate. I came back later in the afternoon and he insisted on showing me, obviously excited and proud. I got the sense that psychologically, this was an obstacle that was really bothering him. "It may take me awhile to get going," he said. "It's been an hour or so since I last tried it." He grabbed his bike from the garage, wheeled it out to the edge of the street, and pushed away from the curb. Off he went, sailing down the street proud as a peacock. I was proud, too, smiling broadly. Into the evening he went back and forth, cementing the riding sensation into his brain, traveling from the end of our driveway to the end of the block, and back again. "I think I might need a bandage," he said eventually popping into the house after a long stretch. He had taken a turn a little too tightly and went down, scraping away a swath of skin on his elbow. It was an impressive wound, covered in dirt and weeping. "I also got these," he said, pulling up his pant leg to reveal two additional trophies on the side of his knee. To his credit, he kept on biking and left the dressing of the wounds for later. This wasn't an easy win for Ben. He had built up his inability to ride a bicycle in his mind and was fully expecting it to take weeks to figure out. To say that he was excited and proud would be a gross understatement; he was glowing. It struck me that this might have been the first time he had been significantly scraped up and bruised. By his age, the number of goose eggs, cuts and face plants I had experienced was off the charts. That said, in 1977, video games were still a ways off, arcades were expensive, and our leisure time was spent in one of two places: in front of the TV or outside. Outside was life, complete with its speed bumps and hidden curves. Injuries, large and small, were just part of the deal, as essential to the DNA of childhood as cake and ice cream. I'm glad that Ben ended this triumphant day with a few scars, as strange as that might sound. I think it heightened the achievement and solidified the memory. 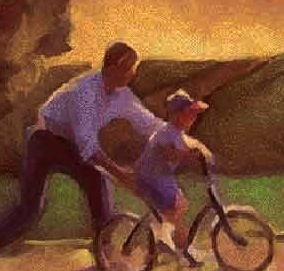 We had encouraged him with admonitions that once he learns how to ride a bike, he'll never forget. "It's like riding a bicycle" is one of the most used catch phrases in the English language to describe certain learned activities that just come back to you, like they never left. I feel grateful knowing that he now knows what that saying means, and that he has the scars to prove it.